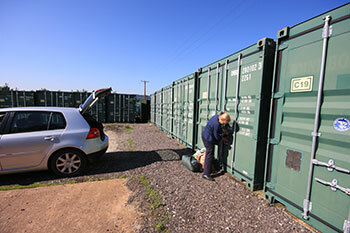 At Hunthay Farm we offer short or long term container storage within our secure compounds in Devon. We can provide you with 20ft long (1,170 cu ft) shipping containers. 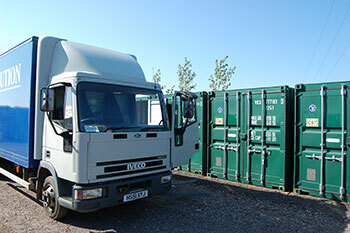 Our container units are of high quality to ensure anything stored inside is kept in good condition. Hunthay container storage offers a robust and flexible solution for your requirements. Storing household goods or business equipment has never been easier with container storage. It is convenient and hassle free. Your storage needs will be met by our strong, onsite security, 24 hours a day, 7 days a week. You can drive right up to your storage container making it easier to load or unload, including lorries, vans and cars. We provide storage for personal, business, commercial and domestic use, so call Hunthay Storage today if you require a container storage solution. We are local, convenient and secure. Long day access- 6am to 9.30pm prompt. 7 days a week. "Come and use our container storage units"
"Easily accessible container storage units"
For a free quote on your container insurance, please use the plugin below. This will allow you to find out how much it will be to insure your container per day and per week, ensuring you have all of the knowledge needed to move forward with the process.